Sanjeeva Onteddu, M.D., center on the video monitor, works with ProMed Ambulance Service paramedics to demonstrate how the live video telemedicine system installed in the ambulance will work in the field. 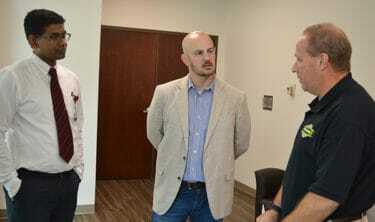 Oct. 9, 2018 | To provide faster stroke care, an emergency medical services stroke telemedicine pilot study was recently established by the University of Arkansas for Medical Sciences (UAMS)-led AR SAVES program, the Arkansas Department of Health and ProMed Ambulance Service in El Dorado. 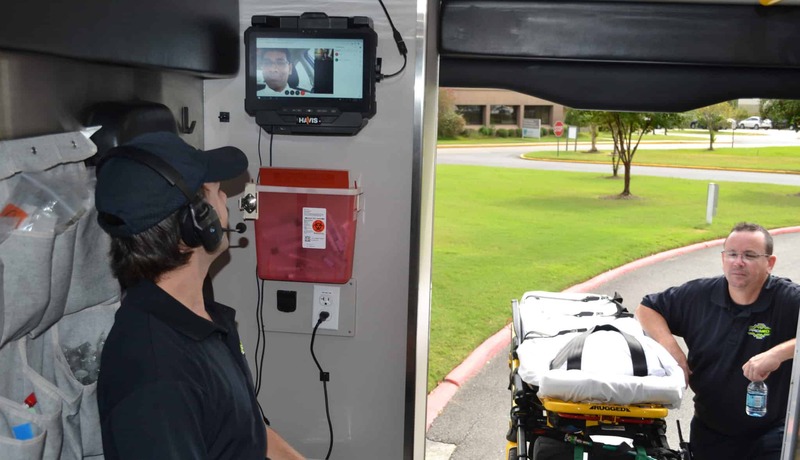 As part of the pilot study, telemedicine equipment has been installed in a ProMed Advanced Life Support (ALS) Ambulance to provide a live, mobile video consult with a stroke neurologist. 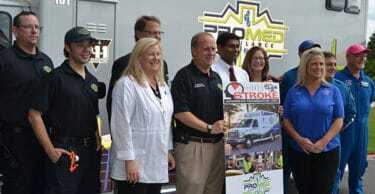 Personnel and staff from AR SAVES, ProMed and Medical Center of South Arkansas gather for a photo next to the ProMed ambulance that will be used in a telemedicine pilot study. The AR SAVES (Arkansas Stroke Assistance through Virtual Emergency Support) program is a partnership between the UAMS Center for Distance Health, the state Department of Human Services and 55 participating hospitals, including Medical Center of South Arkansas in El Dorado, Magnolia Regional Medical Center, Ouachita County Medical Center in Camden and Ashley County Medical Center in Crossett. The pilot program will study the effectiveness of telemedicine in an ambulance in decreasing the treatment time for stroke patients arriving at area hospitals via ambulance through better identification in the field and enhanced pre-notification to receiving hospitals. Sanjeeva Onteddu, M.D., left, talks with State Sen. Trent Garner and Ken Kelley, ProMed Ambulance Service CEO, about the AR SAVES program. The telemedicine equipment’s electronic, wireless connections have been tested in various areas of the region and are working well. Protocols and training with paramedics to perform a modified stroke assessment have been implemented. Mock drills with the AR SAVES Call Center and training sessions with the staff at area hospitals also have been completed. 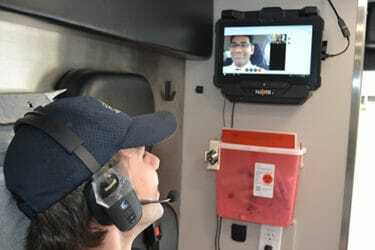 Nich Miller, ProMed paramedic, talks with Onteddu via a live video connection in a ProMed Ambulance. “ProMed is excited to take part in this pilot study with all the partners involved, especially because of what it enables us to offer to the people of Union County and the areas around it — a stronger hope of survival and recovery from stroke,” said Ken Kelley, ProMed CEO. Only 1 percent of stroke patients living in rural Arkansas received stroke care before 2008 when the AR SAVES Program began. Today, more than 34 percent receive care. Nearly 70 percent of AR SAVES patients treated have completely recovered or recovered with slightly impaired function.